FOFriday 2-2-18 — Knit'n Kitten Fiber Arts, Inc. Completely finished with this bag. The construction was interesting since my experience so far was mostly with knitted fabric, and I hadn't used quilted pieces at all. The body pieces were two approximately 12 inch square pieces and one strip 54 inches long and 4 wide that wrapped all the way around and formed a "lid" as well. The quilting on the strip was run perpendicular to that of the bag pieces both for interest and as a practical matter of sewing. Once all the pieces were quilted, I decided to go with a bit of a "deconstructed" look and sew the seams to the outside. Which wasn't necessarily a bad idea, but made me sort of crazy so I used handspun wool in a triangular blanket stitch to cover all the raw edges. That gave me an excuse to do a chain stitch detail in the same yarn and frog closures tatted from the yarn as well. The next step was to make and attach the handle. I used a 4-strand braid made from 2 strips of the backing fabric, one of the lining t shirt fabric, and one of the organza covering fabric that was used on the sides. 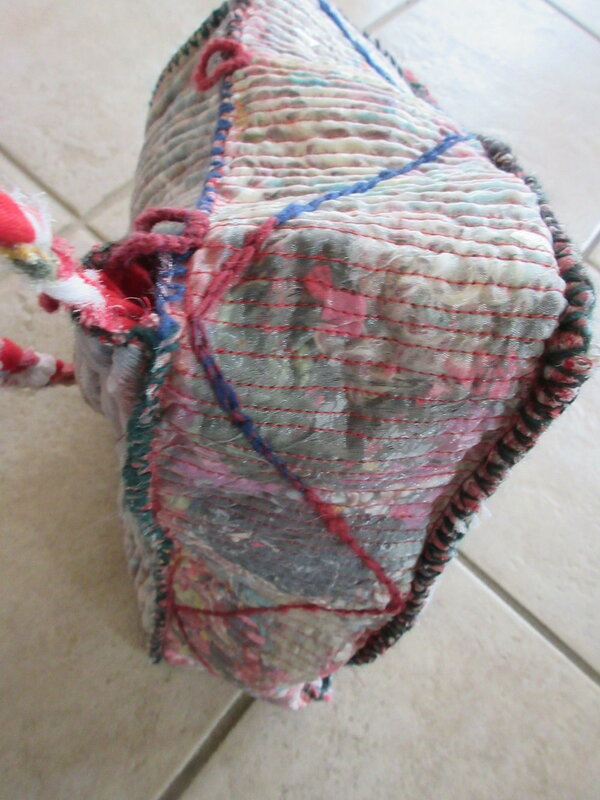 After braiding this was sewn firmly onto diagonal corners both to make the bag hang in a stable manner and also because the other two corners had been seamed as part of the lid so there wasn't actually much choice. Lastly, I pinned in the lining fabric (one of the misprint shirts I'd gotten from the local silkscreen shop) after seaming the bottom into a rectangular box shape. I blind-stitched the lining in by hand, making sure not to go through the top of the quilting and paying particular attention to the area around the handles to make sure they were strong and tidy.